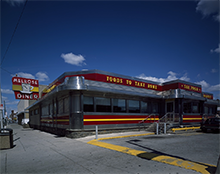 The Melrose Diner, Philadelphia, Penn­syl­va­nia, is an iconic diner — some say the iconic diner — in South Philadelphia. To really understand the place, read Robert Huber's fascinating 2011 piece from Philadelphia Magazine. Photo by Carol M. Highsmith, courtesy U.S. Library of Congress. We began last time to explore the power and hazards of anecdotes when used as tools of persuasion, examining how two different cognitive biases, the Availability Heuristic and the Focusing Illusion, could lead to disadvantageous outcomes when anecdotes are involved. We continue now with another more complex example of a hazard of anecdotes. That hazard arises from what information economists call information cascades. Combining information cascades, cognitive biases, and the properties of anecdotes, we can better understand how muddled thinking and wrong ideas propagate through organizations to become the bases for dominant — but tragically incorrect — ways of thinking about issues. Information cascades occur when rational individuals disregard the contra-indications of their private information and instead mimic the choices or actions of others. For example, suppose you're seeking a restaurant for lunch upon arriving in an unfamiliar town. You see two restaurants, A and B. A is recommended by your travel guide, but it's fairly empty. B is busy, but it doesn't appear in your travel guide. Choosing to lunch in B, despite the travel guide's recommendation, can be an example of the effects of an information cascade, because your decision is influenced by the choices of those who preceded you, despite the information, or lack of information, in the travel guide. B's popularity might actually be the result of a number of similar decisions, following uninformed random choices by the first few diners, rather than an indication of superior dining [Banerjee 1992]. In most models of information cascades, the decision-makers are assumed to act rationally, but in some variations of the concept, that assumption is relaxed. The relaxation of the rationality assumption enables introduction of cognitive biases into the mix, as a means of explaining otherwise mysterious collective behavior. One cognitive bias of special interest in connection with information cascades is the Availability Heuristic, which leads us to overestimate the likelihood or importance of some attributes of a situation, when those attributes are easy to observe, easy to imagine, or easy to recall. That's where anecdotes can play an important role. transmit to othersanecdotes makes some attributes of a situation easy to remember and easy to transmit to others, beyond their actual importance in the situation. In effect, anecdotes amplify the effects of the Availability Heuristic. And in combination with non-rational variations of the information cascade, anecdotes and the Availability Heuristic enable non-rational choices — muddled thinking — to propagate through an organization in a self-sustaining way, capable of resisting rational attempts to dissuade the group from its poor collective choices. Would you like to see your comments posted here? rbrenrXmmsapebckllRnQner@ChacqblvJAkOyAnoyXBHoCanyon.comSend me your comments by email, or by Web form. I offer email and telephone coaching at both corporate and individual rates. Contact Rick for details at rbrenGvXOazFwLWUbXaAAner@ChacipCnIYOauHuJuuZBoCanyon.com or (650) 787-6475, or toll-free in the continental US at (866) 378-5470.